The romantic city of Cartagena, white-sand Caribbean beaches, beautiful Coffee Country and sizzling salsa dancing combine to make Colombia a wonderful honeymoon destination. This list covers some of the top destinations to consider when making plans for your post-nuptial getaway. Colombia offers a wide range of options for honeymooners, depending on your taste. Any honeymoon itinerary should include at least a couple of days in Cartagena, possibly the most romantic city in South America. From Cartagena, you could simply spend a few days at nearby Caribbean beaches or the islands just off-shore. With a bit more time, it’s worth heading south to explore another region of the country, such as the Coffee Country, a scenic national park or the small pueblos just north of the capital. Adventurous couples will find plenty of activities on offer across the country. There’s mountain biking, horse riding, and river rafting, plus opportunities for short hikes and longer treks. Cartagena in romantic evening light. The Caribbean coast is the most popular destination for honeymooners considering Colombia. If you are short on time (3-4 days) it's best to just visit Cartagena the Rosario Islands. 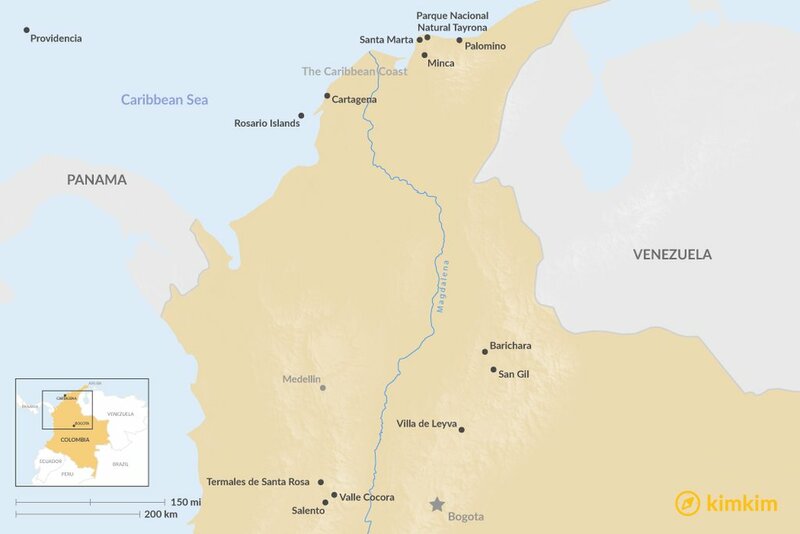 If you have a week or so to spend in the area, you can add on destinations around Santa Marta, including Minca, Parque Nacional Natural Tayrona or Palomino. 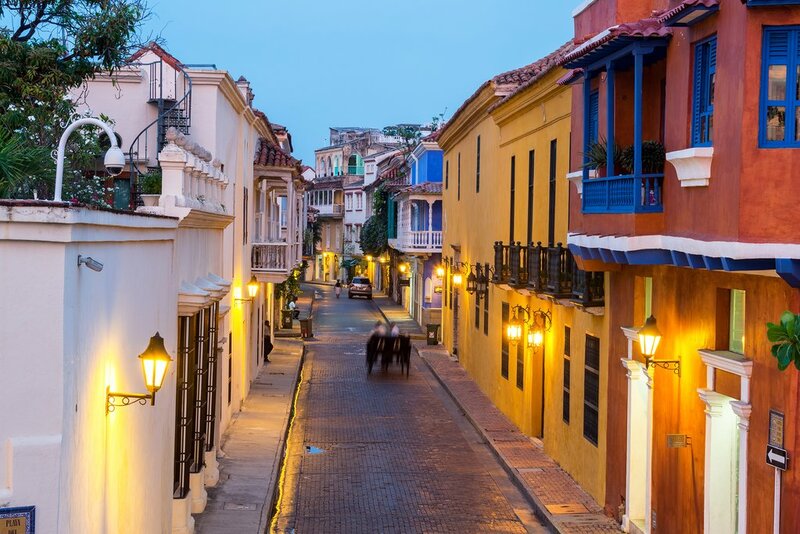 The colorful streets of Old Cartagena ooze with romance, making this the ideal place to start any honeymoon. Spend a warm evening strolling about town, enjoy a candle-lit meal and go for a tour of Cartagena in the back of a horse-drawn buggy. You and your sweet can get great views town from some of the old Spanish forts. Make sure to get some drinks and watch the sunset at the Bastion of Santo Domingo. Cartagena has excellent restaurants and drinking spots, many with romantic views of the sea. Hotels are varied and include some large chain hotels, but we recommend staying in one of the cozy boutique hotels in the Old Town. There’s no shortage of nightlife, with many bars and nightclubs blasting salsa and vallenato. One fun option is to take a night trip aboard a chiva (Colombian bus) with live vallenato musicians and bottomless glasses of aguardiente. A visit to the Rosario Islands off the coast is a must-see for honeymooners. You can visit these small coral islands with white sand beaches as part of a day trip or stay overnight in a bungalow. Tour operators can get you out here for reasonable rates or you could go all out and hire a private yacht. Colombia’s Caribbean coast offers a number of good beaches and quiet getaways for honeymooners. Start your trip In the mountains above Santa Marta, where you can visit the small mountain village of Minca, a popular place for jungle tours, bird-watching, mountain biking and tours of coffee farms. 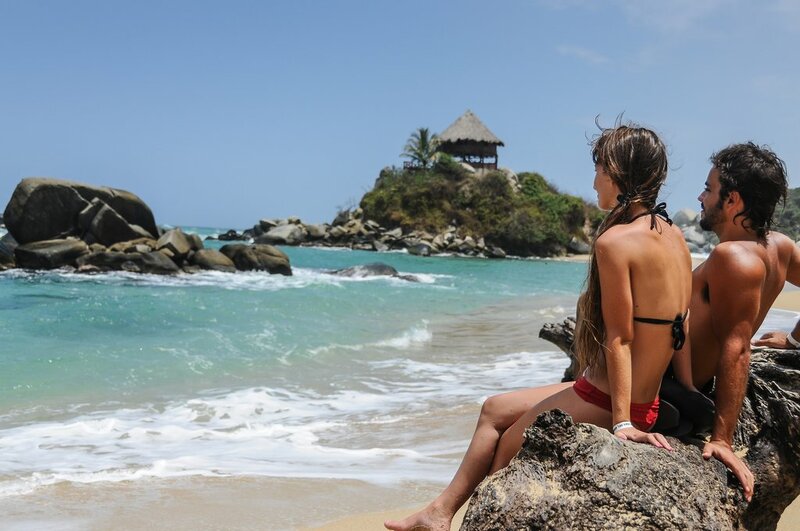 Back down on the coast, spend some time at Parque Nacional Natural Tayrona, a popular national park with beautiful beaches and rainforest. It’s a wonderful place for swimming, snorkeling and jungle walks. There are campgrounds, eco-cabins, and some excellent hotels. Further along the coast, you’ll happen upon Palomino, a small town with lovely beaches and the indigenous Wayuu people making a living by fishing. Palomino has a number of quiet hotels and open-air restaurants, many of them offering budget-friendly rooms and meals. Waterfalls at Termales de Santa Rosa, a relaxing place with hot springs. Colombia’s Coffee Country is the perfect place for couples to unwind for a few days. Not only will you tour coffee farms and experience the coffee production process (which includes drinking some great Arabica), you can also ride horses, go on jeep tours, bike down old country roads and soak in hot springs. 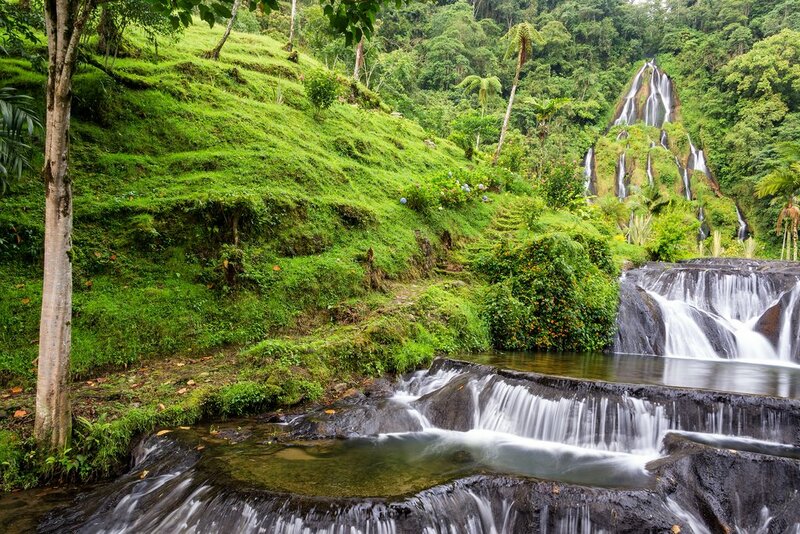 Some of the best places to visit in the Coffee Country include the stunning waterfalls at Termales de Santa Rosa, where you can enjoy hot baths in the shadow of a gorgeous cascade. Among the many towns in Coffee Country, honeymooners will certainly enjoy Salento, home to boutique shops, excellent restaurants, and good nightlife. Make Valle Cocora a stop on your itinerary. This beautiful valley with good hiking trails contains the numerous wax palm trees, which soar 150 feet into the sky. Active couples may also want to consider a visit to Parque Nacional Natural Los Nevados, a national park with challenging hiking trails and great views of snow-capped peaks. Colombia’s Coffee Country has a number of excellent countryside haciendas, where you can spend a few relaxing nights. Many of these are located on working coffee or fruit farms. One of the best is Hacienda Venecia. 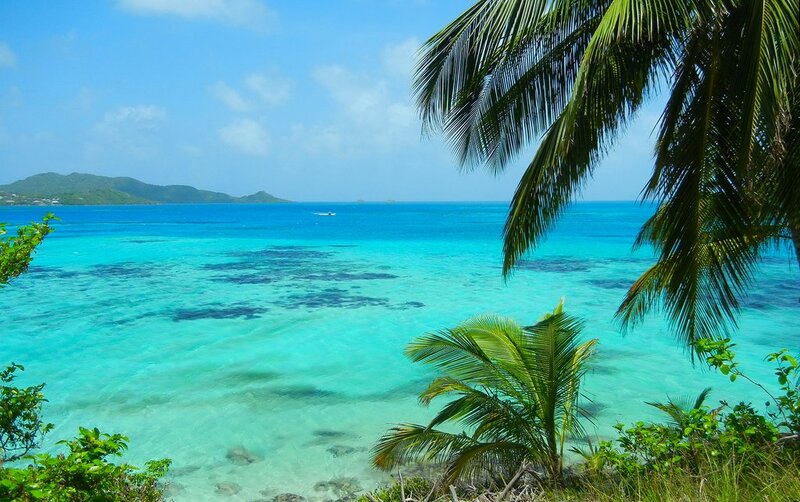 Tranquil waters around Providencia make for a perfect romantic getaway. Beautiful Providencia is a honeymooners delight, a tropical island paradise with lovely landscapes, peaceful villages, and classic Caribbean laid-back culture. It’s free from mass commercialization and features small, secluded boutique hotels where you can while away the hours swimming in the sea and going for romantic walks along the beach. There’s good snorkeling and diving, plus excellent restaurants serving fresh seafood. Due to the remote the remote location of the island and lack of city lights, Providencia is also a perfect place for stargazing. Traveling by scooter is a fun way to get around the island or you can go by bike. Providencia is not the easiest place to reach. It’s 90km north of the island of San Andrés and reached by small aircraft. San Andrés has frequent connections to the Colombian mainland. Street scene in Barichara, possibly the most romantic town in Colombia. If you flew into Bogotá and already spent a few days exploring the capital, take three extra days and travel north to explore the small towns of Boyacá and Santander. After a night in historic Villa de Leyva, continue north to San Gil, the adventure capital of Colombia. You can swim in natural pools at the base of waterfalls, rappel off rock walls, and go rafting or mountain biking. 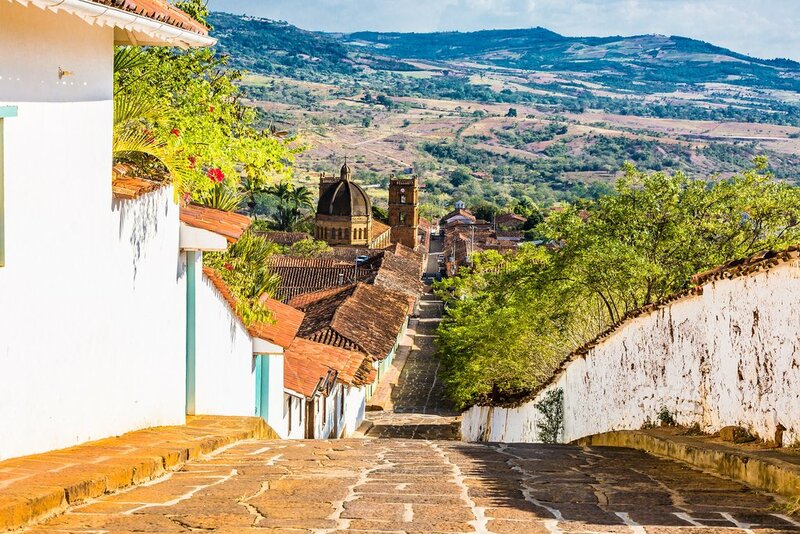 From San Gil, make your way to Barichara, possibly the most romantic colonial town in the country. Its cobblestone streets are beautifully-lit up at night, perfect for evening strolls. The town has a number of good boutiques and art galleries, where you can pick-up keepsakes from your Colombian honeymoon.